ADATE is an inter-institutional network that aims to generate interdisciplinary awareness, inspire new research and teaching initiatives, and foster university, clinical, industry and government collaboration in the area of tissue engineering. We have grown into an international network facilitating collaborations and exchanges between professors in the US, Europe and China with Australian researchers. The most prominent universities in the network are Sydney, Harvard, Tufts, PENN, Stanford, Hong Kong and Drexel. Every two years we convene an international symposium on tissue engineering. ADATE was known as the Sydney University Tissue Engineering Network (SuTEN) from March 2006 to early 2013. 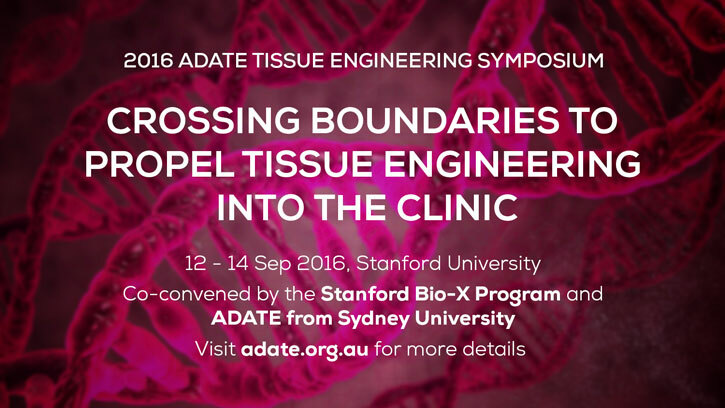 The 2016 6th ADATE Tissue Engineering Symposium will be co-convened with Professor Sarah Heilshorn along with Stanford Bio-X and be held at Stanford University, California, USA. For more details click here or contact Professor Hala Zreiqat .